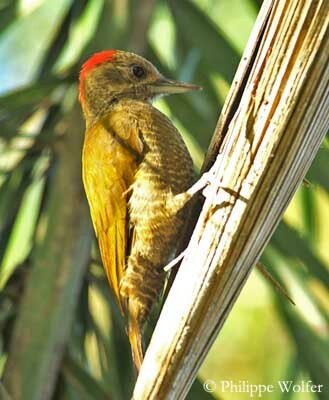 The Little Woodpecker is uncommon or locally common throughout the range. The species is adaptable and able to live in a variety of wooded habitats. It is not threatened at this moment and considered of Least Concern. The Little Woodpecker is a small bird as the name suggests. This South American species is fairly common within its range. 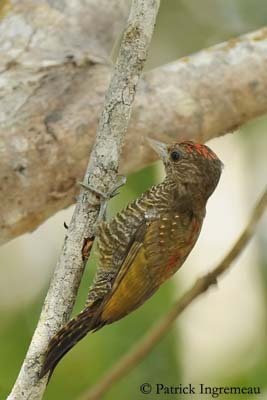 Adult male of nominate race has bronze olive-green upperparts with some red-tipped feathers, and/or variable paler indistinct barring which is more conspicuous on rump. Small whitish spots are visible on median wing-coverts. The flight feathers are brown with green edges, broader on secondaries and tertials. Uppertail feathers are dark brown with finely barred outer rectrices. Underparts are dark olive barred buffy-white. Underwing is barred olive-brown and whitish. On the head, forehead is greyish, and male has red forecrown and nape with dark feather bases. The rest of the head is dark brownish-olive, with pale tips on neck sides. Chin and throat are barred whitish. It has long, straight, grey bill with paler lower mandible. Eyes are dark brown. Legs and feet are dark grey. 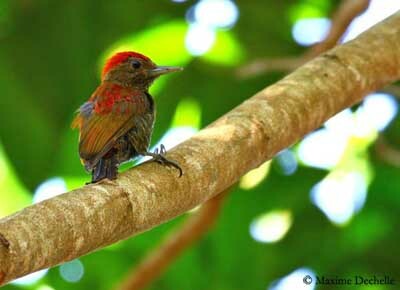 We find some birds from Mana, in French Guyana, showing red feathers on the back. Female lacks the red crown. She has greyish olive-brown head with weak pale spots. 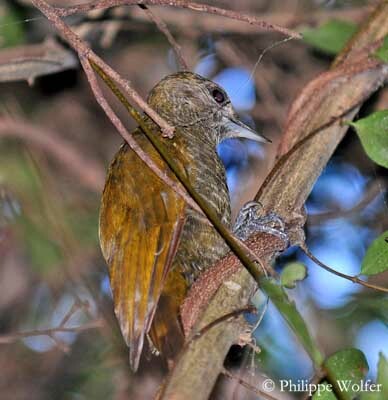 Juvenile resembles adult but duller, with less bronze, irregular barring below and paler eyes. Both sexes have dull red crown patch, but it is smaller in young female. We can find nine subspecies sharing the wide range. 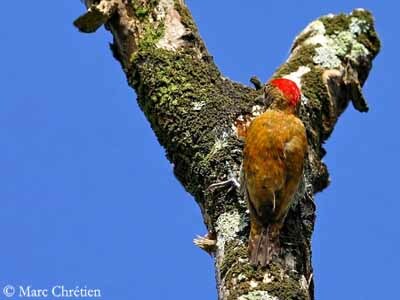 They differ mainly in facial pattern, extent of the red patch in male, tone of upperparts and amount of spots and bars. Size may also be variable. The subspecies V.p. olivinus (here displayed on the right), occurs in S Bolivia, S Brazil, Paraguay, NW and NE Argentina. This race is larger, with short pale supercilium (often absent), and thin whitish moustache (often partially absent). The male has restricted red patch on hindcrown and nape. Forehead and forecrown are olive-green finely spotted pale. The female is similar to that of nominate race. The Little Woodpecker utters high-pitched, dry rattle. When excited, the bird gives series of “wicka” notes. The territorial call includes first a short drum, and then, a long-distance call “ki,ki,ki,ki” or “wi-wi-wi-wi-wi-wi”. 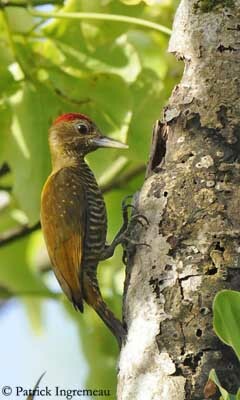 The Little Woodpecker frequents humid terra firme and várzea forest edges, but also cloud forest and gallery forest edges, borders of swampy lagoons and river banks. It may be found in deciduous woodland, mangroves, densely wooded savannahs, caatinga and areas with scattered trees. 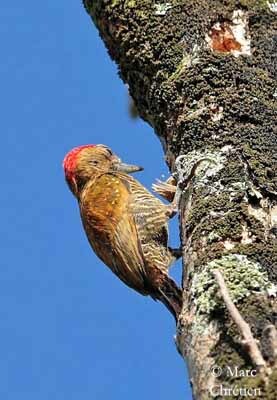 The Little Woodpecker can be seen from 400 to 1200 metres of elevation according to the range. 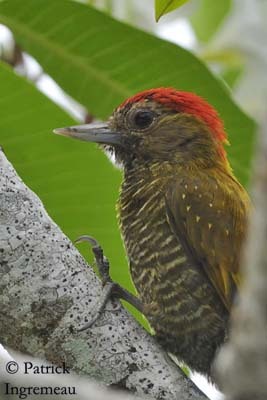 The Little Woodpecker is resident within the wide range, a large north-eastern part of South America east of the Andes. 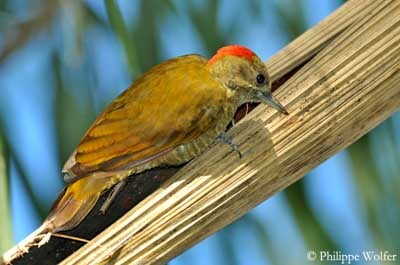 The Little Woodpecker is usually seen alone, in pairs or in small groups, foraging from low undergrowth to high in trees. It mainly feeds on insects and larvae in semi-open areas. It pecks vigorously on bark and branches. It also drills small holes by hammering. 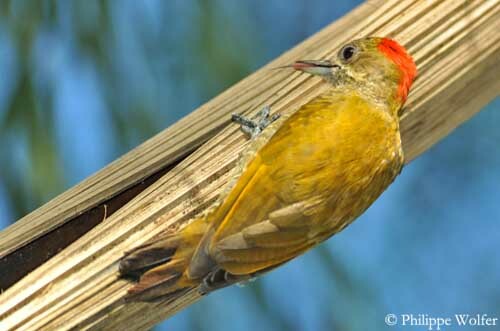 This woodpecker remains inconspicuous at it taps and chisels on hard surfaces with the bill. This species performs typical courtship displays such as wing-spreading, head-swinging and tail-spreading. The male exposes the red head feathers which are erected during courtship and territorial displays. The Little Woodpecker is resident in its range. The Little Woodpecker performs the characteristic undulating flight of woodpeckers. Breeding season varies according to the range. 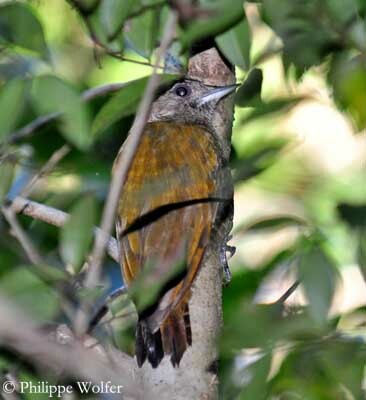 The nest is probably excavated by the male alone in stub, palm or bamboo, at about 5-13 metres above the ground. Observations tend to suggest that male alone rears the brood. Clutch size and nesting behaviour are poorly known at this moment. 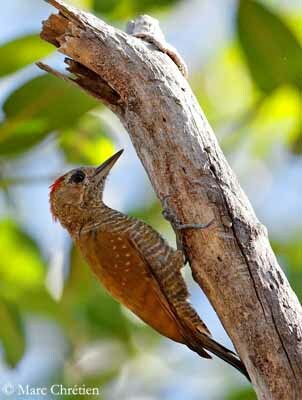 The Little Woodpecker feeds on ants, termites, beetles and their larvae, and numerous other insects. It forages alone, in pairs or in small groups and may join mixed species foraging flocks.